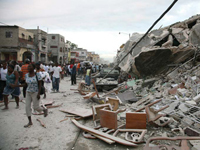 A major earthquake centered just 10 miles from Port-au-Prince has devastated sections of the city and knocked out telephone communications throughout the country. Reached via email, Partners In Health (PIH) staff in the Central Plateau region report that they experienced a strong shock but no major damage or injuries. They are still attempting to establish contact with other PIH facilities and to locate several staff members who were traveling in and around Port-au-Prince. The earthquake destroyed much of the already fragile and overburdened infrastructure in the most densely populated part of the country. A massive and immediate international response is needed to provide food, water, shelter, and medical supplies for tens of thousands of people. Currently, the greatest need is financial support. Haiti is facing a crisis worse than it has seen in years, and it is a country that has faced years of crisis, both natural disaster and otherwise. The country is in need of millions of dollars right now to meet the needs of the communities hardest hit by the earthquake. PIH facilities are strategically placed just two hours outside of Port-au-Prince and will inevitably absorb the flow of patients out of the city. In addition, PIH needs cash on-hand to quickly procure emergency medical supplies, basic living necessities, as well as transportation and logistics support for the tens of thousands of people that will be seeking care at mobile field hospitals in the capital city. Any and all support that will help them respond to the immediate needs and continue their mission of strengthening the public health system in Haiti is greatly appreciated. Please join Rocklopedia and donate to Partners in Health Earthquake Relief Fund.